I wanted to sleep in and have a lazy amble to Hel – it should have been a short day. I am now in Hel and tired. I am quite looking forward to a cycle-free day due to the boat schedule. My mad rush to Łeba yesterday was partly motivated by the big sand dunes there. I thought I would nip past them in the morning before descending into Hel. That was my grand plan. I was told that the dunes were 7km out of Łeba – in the opposite direction to where I was going. Mm. 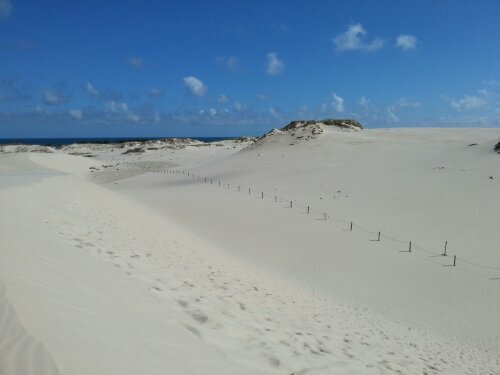 Well, I had come to see these sand hills, so 7km it will be. Actually it was 10km – 7 km from the other side of Łeba. 20km round trip. 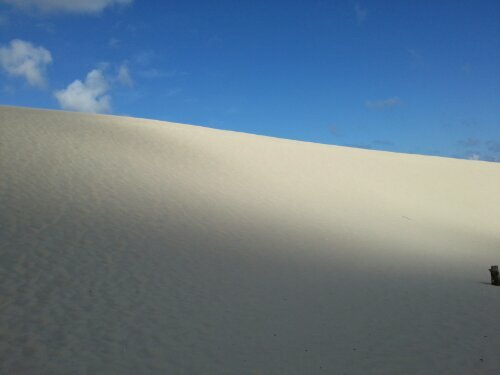 The sand hills were nice but I felt tired. I hadn’t slept well, and not very long. Thinking I had seen the worst the Polish bike paths could throw at me, I hit the soft sand road out of Łeba. Forget cycling. It’s hard work pushing the bike through the deep sand. The bad part was, I had no idea how long the sand part would be. I had about 20km of small roads, according to the map. Would it be like this for hours? I was getting more tired and I felt the frustration rising. I wanted an early evening in Hel. I screamed out at the road after another short cycling stint was again aborted as I slid off the bike. The bitumen road started around the next corner. From then on I asked locals, and used my paper map. It showed the road conditions accurately. Lunch was had at Choczewo. 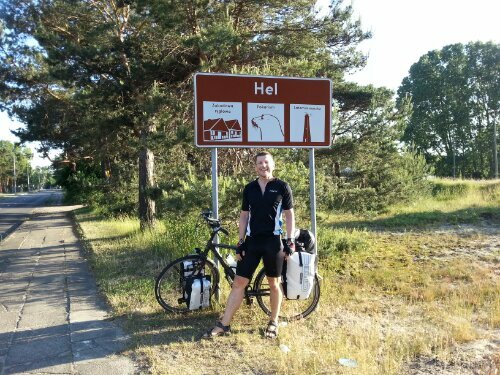 After some energy returned, and the frustration dimmed, I took up a recommendation by Simon from the Polish cycling forum. He has been very helpful with all sorts of tips for me during my stay in Poland. We had been whatsapping over lunch. I took the back roads (all bitumen I was assured) along a hilly route. Down to a lake and up the steep climb the other side. It was lovely scenery – truly picturesque. I realized, though, that I was just tired and wanted to get to Hel. I hit the coast and then Władysławowo before cycling down the Hel peninsula. A wind surfing paradise, the peninsula has a holiday feeling and us very peaceful. The peninsula is 34km long, and at the bottom is Hel. D: Matthew’s going to Hel today. V: Where’s that? D: Poland. V: Of course! And it’s where I’ve come to rest. 🙂 There is only one boat a day from Hel across the River Styx – I mean the Baltic Sea. To pay you need to put a 1 złoty coin between your teeth. For the tourists they also accept a 1 Euro coin, but they don’t give change. This is apparently in breech of some European law. When pressed about this, the ferryman just says ‘go to Hel’. I think that You were “cycling” a walking path, no a bike path. Check some paper map for it.